Infosearchbox.com is the PUP that uses misleading techniques to prevent removal. Use Reimage to locate malicious components and get rid of them faster than with uninstall instructions. A full system scan blocks virus reappearance and prevents traffic to malicious domains. Why are Infosearchbox.com redirects dangerous? How to avoid Infosearchbox.com hijack? How to remove Infosearchbox.com browser hijacker? This browser hijacker slows down the computer system, makes annoying ads appear and generally decreases the performance of the PC. Who would want to keep such vague program on their computers, especially if it has slithered in there without user’s approval? If your computer has been affected, we recommend you to hesitate no more and carry out Infosearchbox.com removal. For that, you can use the Reimage software. If you do not want to use automatic spyware removal tool, then try to delete it manually using instructions provided at the end of this article. Potentially unwanted programs like Infosearchbox.com hijack computer systems with the help of software distribution technique that is called software bundling. This method allows spreading several programs together in a one software package. Typically, such package looks like a simple program, and there are no signs indicating that it contains several additional apps. However, if keeping your computer spyware free is a thing of utmost importance to you, then you should check components of every file or program that you download from the web. Typically, it is enough to choose Advanced or Custom settings for the installation and opt-out all suggested files and programs by removing the checkmarks next to them. Free programs might offer you free search tools, weather apps, media players, file converters, shopping assistants, and similar freeware to install for free, but remember that such programs in most cases are nothing more than unwanted software that displays annoying advertisements. If you do not want to be bombarded with annoying web ads, better stay away from untrustworthy third-party software. To say goodbye to this hardly useful program, you need to uninstall suspicious extensions, delete cookies, or just reset your web browsers. However, you also need to remove Infosearchbox.com virus remains from the system, too. If you have never done this before, and it seems like something difficult to do, you can take a look at these Infosearchbox.com removal instructions that we have provided. We believe that it should become apparent how to uninstall this program manually then. If you believe that your system is contaminated with additional spyware threats, then run a system scan with our recommended program and reveal all potentially unwanted programs lurking on your system. Here, look for Infosearchbox.com or any other recently installed suspicious programs. Wait until you see Applications folder and look for Infosearchbox.com or any other suspicious programs on it. Now right click on every of such entries and select Move to Trash. When in the new window, check Delete personal settings and select Reset again to complete Infosearchbox.com removal. Once these steps are finished, Infosearchbox.com should be removed from your Microsoft Edge browser. Here, select Infosearchbox.com and other questionable plugins. Click Remove to delete these entries. Now you will see Reset Firefox to its default state message with Reset Firefox button. Click this button for several times and complete Infosearchbox.com removal. Here, select Infosearchbox.com and other malicious plugins and select trash icon to delete these entries. Click Reset to confirm this action and complete Infosearchbox.com removal. 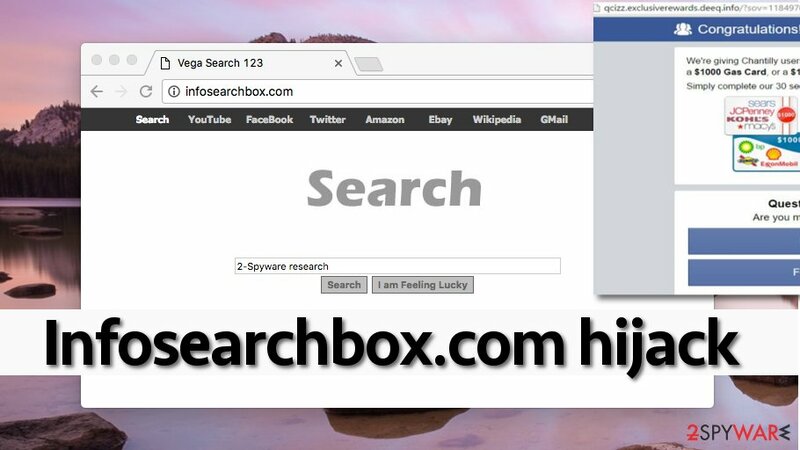 Here, select Extensions and look for Infosearchbox.com or other suspicious entries. Click on the Uninstall button to get rid each of them. Here, look at the Homepage field. If it was altered by Infosearchbox.com, remove unwanted link and enter the one that you want to use for your searches. Remember to include the "http://" before typing in the address of the page. Now you will see a detailed dialog window filled with reset options. All of those options are usually checked, but you can specify which of them you want to reset. Click the Reset button to complete Infosearchbox.com removal process. This entry was posted on 2016-09-12 at 05:48 and is filed under Stealing programs, Viruses. You can quickly scan the QR code with your mobile device and have Infosearchbox.com virus manual removal instructions right in your pocket. How did you remove Infosearchbox.com virus?